To Cite: Shi L, Jiang Y, Sun B. Gastric Perforation Associated with Congenital Diaphragmatic Hernia in a Neonate, Iran J Pediatr. 2013 ; 23(6):712-714. Neonatal congenital diaphragmatic hernia (CDH) is a complex anomaly, the clinical course of which depends on the timing and duration of herniation and the amount of viscera herniated. Acute gastrointestinal complications of neonatal CDH are mainly caused by the incarceration of the stomach and intestines, which are significantly reduced by prenatal diagnosis and appropriate neonatal treatment. 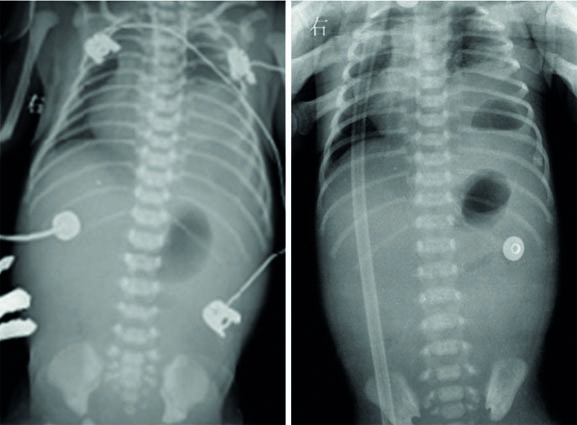 Neonatal gastric perforation associated with CDH is an unusual surgical emergency, the symptoms of which may be quite nonspecific, and the radiographic findings may show pleural effusion and massive hydroperitoneum[2,3]. Rapid diagnosis and appropriate treatment are essential. We present a 4-day-old neonate with gastric perforation and CDH, who was treated successfully. Fig. 1: Left: Supine radiography showing an opacified left lower lung field with a cyst and a diffuse ground-glass opacity with paucity of bowel gas; Right: Erect radiography showing gas fluid level in the left hemithorax. 35 days after admission. He recovered well after seven months of follow up. There have been only a few case reports of neonatal CDH presenting with gastric perforation[1-3]. Two cases were discovered before birth[2,3]. Our case highlights the clinical course and radiography of neonatal gastric perforation associated with CDH, which are important in the diagnosis. There was one similar case observed after birth, symptoms of which were gastrointestinal rather than respiratory in origin. In our case, the symptom of CDH before gastric perforation was recurrent non-bilious womiting rather than tachypnea, which is quite nonspecific, and the clinical course such as tachypnea, abdominal distension, greenish vomiting and rapid deterioration of the neonate came with gastric perforation. The radiography of neonatal CDH often shows an opacified hemithorax with mass effect and contralateral shift of the mediastinum. Bowel gas is lacking in the abdomen and can be identified in the chest. In our case, the radiography showed an intrathoracic cyst rather than loops of bowel in the chest because the hernia consisted only a large part of the stomach. Pleural effusions and massive ascites indicated gastrointestinal complication associated with CDH, which is similar to some other cases[2,3]. Our case suggests that congenital diaphragmatic hernia should also be suspected in the neonate presenting with recurrent womiting. When massive ascites and pleural effusions are noted in association with CDH, gastrointestinal perforation should be considered. Early diagnosis and fluid resuscitation and prompt surgical treatment are imperative.